Lock in a great price for Golden Eagle Summit Hotel – rated 8.6 by recent guests! 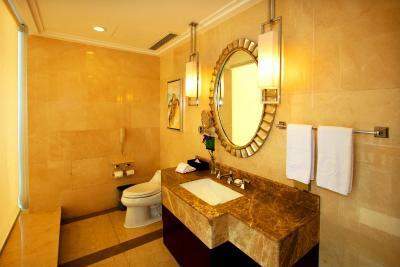 Only 15-minute walk from Jingxing Bird and Flower Market, Golden Eagle Summit Hotel features sumptuous accommodations with free Wi-Fi. It offers a fitness center, billiards, table tennis, meeting facilities and 2 on-site restaurants. Golden Eagle Summit Hotel is a 20-minute walk from Green Lake. It is a 15-minute taxi ride from Nanyao Railway Station and a 45-minute taxi ride from Kunming Changshui International Airport. Rooms here will provide you with a flat-screen TV, a fridge and a mini-bar. Featuring a shower, private bathrooms also come with a bathtub and a hairdryer. Extras include a desk and a safety deposit box. At Golden Eagle Summit Hotel you will find a garden and a terrace. Others offered include ticketing services and a tour desk. Currency exchange and luggage storage can be requested at the 24-hour front desk. There are 2 on-site dining options. Summit Cafe and Summit Palace both serve a fine selection of local food. When would you like to stay at Golden Eagle Summit Hotel? Room comes with a double, a mini-bar, a fridge, a flat-screen cable TV, an in-room safe and an private bathroom. Room comes with a mini-bar, a fridge, a flat-screen cable TV, an in-room safe and an private bathroom. 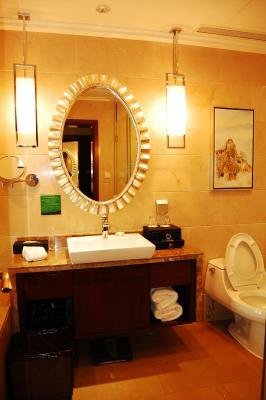 Suite features a living room, a mini-bar, a fridge, a flat-screen cable TV, an in-room safe and an private bathroom. This double room has a bathrobe, mini-bar and cable TV. House Rules Golden Eagle Summit Hotel takes special requests – add in the next step! Golden Eagle Summit Hotel accepts these cards and reserves the right to temporarily hold an amount prior to arrival. Pleaes note the bedding type (Double/Twin) is subject to availability upon arrival. All was excellent. Keep up the great work. The location was ideal and it was one of best kept hotel I've managed to stay in, (most of my hotels are 5 star). Meticulous attention to detail. We did found some English speakers among its stuff but it was way less than other 5* hotels we've been at in China. The room is spacious and clean. If the bed was comfortable and the pillows were superb. I was delighted with the white fungus desserts the hotel send to the room and the rose biscuit every night when they came in for the night turnaround. It was a great "treat" especially after a whole day out at the dry weather. Great location and near to a lot of eatery stores.